Tour operators in Australia have been experimenting with the use of music to lure sharks to their boats. Turns out that sharks love AC/DC. I mean, we all sort of presumed that anyway, but still. The sharks seem to be responding to the frequencies (nice one, Angus Young), rather than the lyrics, at least as far as we know. Using music to attract sharks for the amusement of humans is marginally better than chumming the water: getting great whites to associate humans with food is just breathtakingly stupid. I’d argue that getting the giant apex predators comfortable at all around humans is still pretty sketchy. When Giant Sharks Attack (Airplanes)! 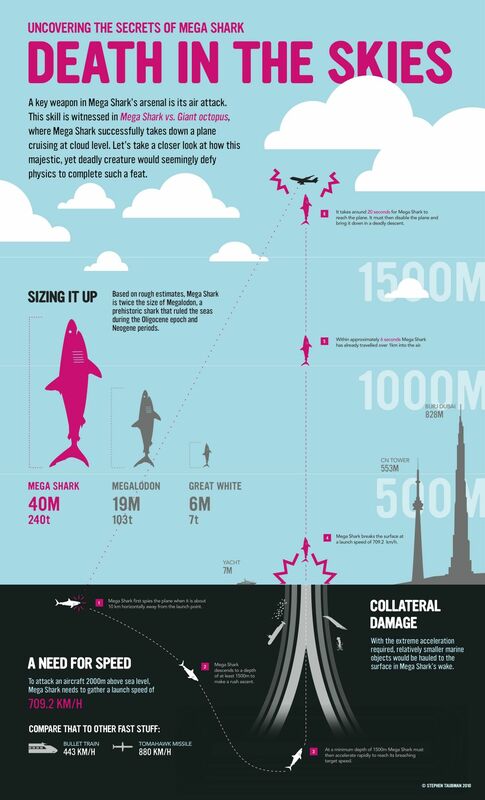 Just when you thought it was safe to go back in the sky… the infographic below should dispel any lingering doubts that flying is safe. Indeed, you can see just how easy it is for a 240-foot-long Great White to come flying up from the ocean depths and sieze your jetliner in its deadly jaws. You know the giant shark will be growling, too, because that’s precisely what giant sharks do. They growl. What, you think this couldn’t happen? Huh? Well, check out the video evidence. Next time you pack for a flight, bring the Shark Repellent Bat-Spray.